So many wonderfully well-deserved tributes have been expressed since our community first heard of the sad loss of Jeanne Bovard, long-time leader of the Scranton Area Community Foundation. So many voices articulating that which we all knew of Jeanne’s remarkable contributions toward the betterment of life in our corner of the world. She was “a true community leader,” “passionate” and “committed to our future.” She was “one of a kind.” Richly accurate and well-earned accolades all. But as a very special friend to NeighborWorks NEPA, I can state with certainty that the truest gift Jeanne Bovard ever bestowed on our community was so generously sharing her exceptional faith in the goodness of people and how that shaped her extraordinary vision for making life better in our community. Very simply stated, she saw things that most of us couldn’t and she brought us all along while she put it all into action. Just think about the sheer volume of community firsts that have Jeanne’s fingerprints all over them. A joint service program between Marywood and the University of Scranton? Jeanne started the Collegiate Volunteer program. The city, county and school board find it hard to work together? Jeanne set the table for Scranton Tomorrow. Over 21 non-profit organizations are diluting the power of effective investment in regional housing? Jeanne crafts the Housing Services Collaborative which continues to reap millions in resources some 20+ years later. Not to mention being on the ground floor for other efforts like Leadership Lackawanna, the Voluntary Action Center and Community Foundations of Pennsylvania. Jeanne Bovard showed us, time and time again, that hope is an invaluable commodity in which to invest. She will be sorely missed. Yet her belief in the goodness of our community touched so many hearts, that her legacy will live on for generations to come. John was Executive Director of Scranton Neighborhood Housing Services (now NeighborWorks NEPA) from 1995 through 1999 and on the Board of Directors from 2001 through 2016. He is currently the Executive Director of AllOne Foundation & Charities. Pictured: Jeanne Bovard, front left, received NWNEPA’s Governor Robert P. Casey Medal for a Lifetime of Service in 2008. 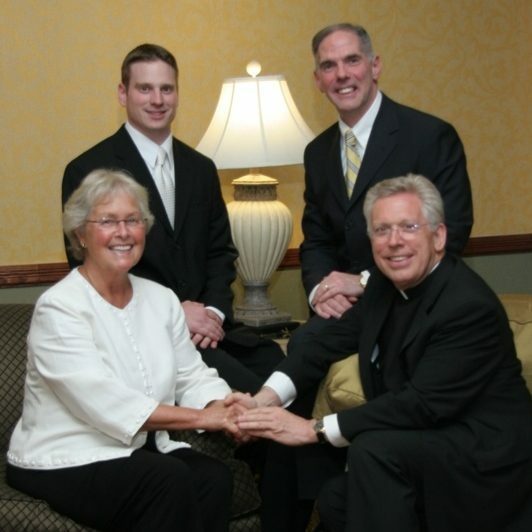 Clockwise from back left: Jesse Ergott, NWNEPA President & CEO; John W. Cosgrove, Event Co-Chair; Monsignor Joseph Quinn, Event Co-Chair.